Our modern, stylish, three level holiday home is located within walking distance to Queenstown. Orientated to maximise summer and winter sun with mountain, lake and town views, there's a lovely balcony area to entertain and relax in the summer with a heat-pump, air conditioning, double glazing and gas fire for exceptional heating during the winter months. This three level home has lovely high ceilings and you'll just love picking your spot to relax with a glass of wine after a day's sightseeing to watch the sunset..
Each bedroom has spacious ensuite bathrooms, each with a contemporary, luxurious finish. The kitchen is fully equipped, has stone bench tops and everything you'll need to feel like you're home... however, those cafe's, bars and restaurant are only a few minutes wander and will tempt you to live like a Queenstown local during your stay!! One allocated car park is provided in the private garage. Bookings of up to six people are accepted. Strictly a maximum of six permitted. The third guest bedroom can either offer a King Bed or two King Singles; simply let us know which configuration you'd like when you book and we'll make the beds up for your arrival. House Rules are to act respectfully... exactly how you would act in your own home.. or your Mothers.. Newly refurbished with new linen and furniture - so please take good care of our holiday home and possessions as you would if they were your own. Always remove footwear inside the house, use the coasters provided for all drinks/ plates on the furniture and tidy away anything you use in the kitchen. Smoking permitted on the deck only. Noise, please be considerate to your neighbours at all times. We spent a week at this apartment. 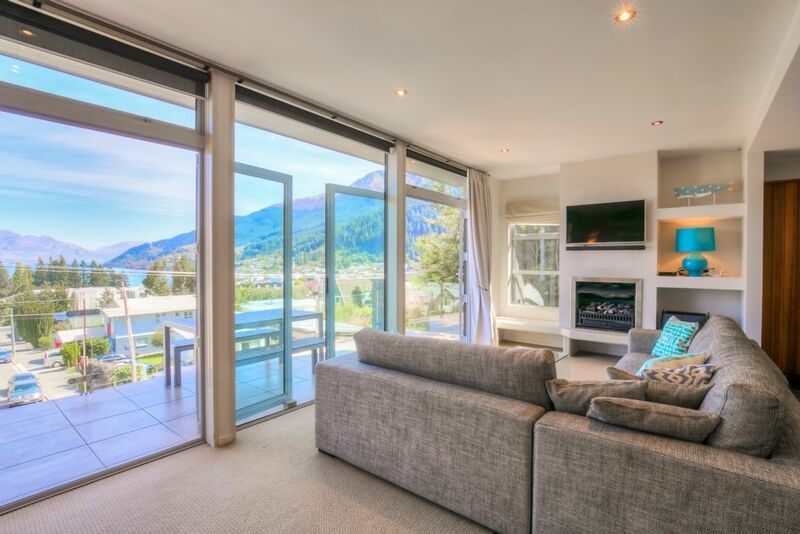 The property is easily found, close to central Queenstown and has a wonderful view of the Remarkables (although this was marred somewhat by two large cranes dominating the skyline). Julie was a very responsive owner and easy to contact if needed. After some initial confusion with linen supply, we enjoyed our stay at this spacious apartment. The apartment is reasonably well equipped although some kitchen crockery was becoming depleted (Obviously some breakages had occurred and had yet to be replaced). The apartment has one garage which is quite tricky to get into unless driving a small car or hatch. The apartment is on three levels which may not suit all potential clients. Wifi is excellent at this property. There are many lovely restaurants in Queenstown and the apartment is well located and within walking distance of the town centre with all its services, shops and facilities. We enjoyed our two nights at Diamond Villa. Great location for walking into Queenstown-- a bit hilly, but a very short and easy stroll. Outside deck and large glass doors make a wonderful indoor/outdoor living area. Enjoyed the fireplace at night. Lovely views day and night. Would recommend for groups up to 6. Location was fantastic, amazing large home with plenty of room and amazing views of Queenstown. Thank you Julie for your friendly emails and phone calls. Three adult couples with their own bathroom is a bonus. Definitely be back! We are 3 couples traveling together and it was great having 3 en suite bathrooms. The view from the condo was fabulous. Lots of room. Very close to Queenstown central but out of the fray. I would highly recommend this condo. Great stay and location perfect ! A great place to stay highly reccommend! A great place to stay highly reccommend! Easy access 5-7 mins walk to town not via Ballarat St as this is steep! We thoroughly enjoyed our time at Queenstown and this property.